Beyond BookSmart coaches provide customized and comprehensive support, foster independence and confidence, help students and adults work more effectively, and teach the skills necessary for success in school and beyond. 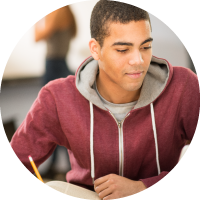 Find out how we provide students personalized tools and strategies for long-term academic success. We are very happy with our daughter’s coach. She provides us with informative updates and reaches out to our daughter and her teachers via text and e-mail. Best of all, our daughter enjoys working with her! Read what our coaches and other experts have to say about helping students and adults thrive.